Hundreds of Granite Staters will gather on Wednesday, January 31 at the Legislative Office Building to show their support for a bill that will protect LGBTQ+ Granite Staters from discrimination. 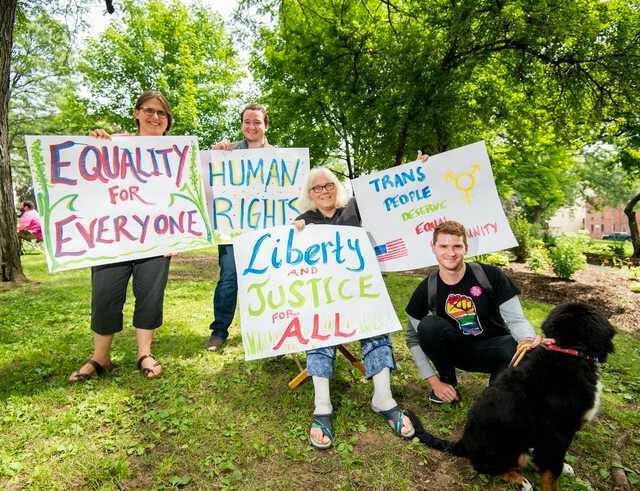 In 2016, Rights & Democracy became a founding member of a strong, bipartisan coalition: Freedom New Hampshire, which is working to update state law to explicitly protect transgender Granite Staters from discrimination. Since 1998, New Hampshire’s Law Against Discrimination has protected lesbian, gay and bisexual people from discrimination in employment, housing and public places like restaurants, retail shops and hospitals. But there are still no explicit protections based on gender identity—and this year, that has to change. A bill, HB 1319, that would update the law will be heard in the House Judiciary Committee on January 31st. Help make 2018 the year we pass it by joining Freedom New Hampshire. Support for this bill has been broad, bipartisan, and unprecedented. Last year, a Republican-led committee recommended our bill overwhelmingly to the full House. Unfortunately, the House didn’t pass it—but a bipartisan group of 179 lawmakers stood with us, the first time such a bill has advanced in a Republican-led legislature. This year, HB 1319 has received influential endorsements from the legislative Children’s Caucus and the editorial board of the Portsmouth Herald. Governor Sununu has created an advisory council to tackle discrimination, including anti-transgender discrimination. And the Business and Industry Association, the New Hampshire Association of Chiefs of Police, and the New Hampshire Coalition Against Sexual and Domestic Violence are continuing their strong support for this bill for the second year in a row. Watch the video from the State House announcement introducing the bill for the 2018 session. And already thousands of grassroots advocates have called and written their lawmakers, urging them to pass these long-overdue protections. This year we can pass this bill—and passing it through the Judiciary Committee is the first step. Don’t miss out on your chance to be a part of this movement: Join Freedom New Hampshire by signing a pledge of support for HB 1319.